Warning: the photos in this page and the next are not real! I just grabbed them off the web. Many of them are real photos of the area. I describe differences where important. The Yucatan peninsula is a chunk of land that sticks out from central america into the gulf of mexico. Most of it is in present day Mexico, plus Belize, and you could even say that northeast Guatamala is part of it. From the air, it is pretty much entirely flat jungle. The land is rarely more than a few meters above sea level. The vegitation rarely reaches higher than ten or twenty feet, but is extremely dense. We're talking machete. I didn't have one along, and my snakebite kit was past its expiration date, so I never went bushwhacking. There are no rivers. Yep. No streams, no lakes, nothing like that. All the rainwater seeps through the limestone and flows through underground caves to the ocean. However, scattered around there are caves, called cenotes (say no tase), where the freshwater is available. This is the only source of freshwater available and the indiginous people depended on them. Divers have been exploring the caves. This is very dangerous work; it's hard enough just to dive in plain water, or to explore above-water caves; these guys have to mess with all of those problems at once. Apparently the caves reach way inland, and also extend out to the ocean, even under the ocean floor. I guess it's hard for them to figure out where they are in those caves. On the ocean sides, the continental shelf extends out far and shallow. You can walk off of the typical beach, hundreds of feet, and the water is only up to your waist or chest. For this reason, it has been difficult or impossible for ships to dock anywhere near land. 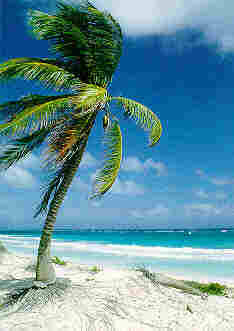 On the other hand, the beaches are beautiful. Take a picture of the most beautiful beach you've seen in a travel brocure, and lay it down and look straight out and you're seeing it in real life. The sand is white, the water is blue and green, the waves are crashing, it's amazing. Starting at the shore and going out into the water is lots and lots of coral, more in some places than others. Some beaches are devoid of coral and are ideal places to just run out into the water in your bare feet. Places where there is coral, though, demand some sort of shoes or sandals. My Tevas worked great, but wimpier thongs would have been a big problem. It's hot. We were there in the winter, and it rained often, but it was rare when I wanted to wear long pants, and it was often that I wanted to go without a shirt. In the summer, you're supposed to sleep in a hammoc because it's so hot and sticky that you don't want anything touching you. All the rooms we stayed in were designed to let the wind blow clear through the building from one side to the other (except for the one air conditioned room). Between the boat problem and the jungle problem and the heat problem, the area has only recently had any serious development. This is also why many of the ruins have yet to be discovered! 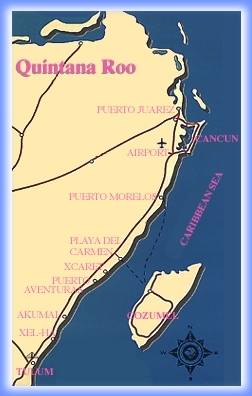 Quintana Roo, the mexican state that all of this is in, only achieved statehood in 1974; before that it was just a territory. 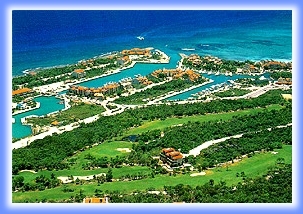 Around then, the government figured out that the area around Cancun should be developed for tourists. Bam, now there is a huge tourist city where you can have all of the modern conveniences of a typical US supermall. We didn't stay there, we went south, where things were somewhat less commercial. The mexican peso has taken a beating for quite a while. Last time I was down, in 93, they had recently done a 1000 to 1 reverse split of their currency. Instead of Pesos, they were using Nuevo Pesos, which were 1000 of the old pesos. Still, they were three to the dollar back then. Then the crash happened a few years ago. This trip, it's about 8 pesos to the dollar. People used different exchange rates ranging from 8.00 to 7.75 for convenience here and there. A dismal number of vendors took american dollars and in many cases quoted prices in american dollars. This was especially true for hotels, scuba places, and other big ticket things. The most annoying thing is how they write them; they use a dollar sign, just like with us currency. When they want to make a distinction, they write "N$". So I have this guide book with a price sticker on it that says "$237" on it. The "Tourist Phones" are pretty nefarious. You don't stick in a phone card, you dial maybe 00 or maybe *0 or something. Then the US/Canada phonenumber, and your calling card number or whatever. Then the next month you get a bill for four hundred dollars. And the month after that a few leftover calls make the bill two hundred dollars. Prices seem to be something around $5 to $7 per minute. Pretty outrageous. Here's an eight minute phone call that cost $42.50. To canada from mexico. During the day. Here's a 22 minute phone call to canada from mexico that cost $148.90, and this was at evening rates. A 3 minute phone call during the day cost $27.15, but get this: it was from mexico to mexico! Even in the same area code within mexico. Should have taken my cellphone, would have been cheaper. There's three separate phone companies listed that billed me (if billed is the right word) on my first bill, and two others on the second. We arrived at the Cancun airport and got a rental car. I've never driven a car outside of the US or Canada, and Meryle didn't know how to do a stick, so Jim drove. There's this road, highway 307, that goes south from cancun along the coast, that we took. Periodically there's towns or side roads that lead to the beach, or to a coastal town, or to a beachfront resort complex. Other than that it's two lanes, and crazy mexican drivers. One tourist pamphlet we saw said to never drive at night because people sometimes drive without lights. If you get stuck behind a slow vehicle, you must pass it by zipping out into oncoming traffic, just like on smaller US highways. (Once we were stuck behind a truck with, no kidding, about two dozen pigs, on three levels. Whew.) We saw them constructing a divided highway, but we couldn't drive on it, and it hadn't really reached Playa Del Carmen yet. The whole trip we kept on being on dirt roads where a cable strung across the road, like in america it would be a clear indication not to go there. But the cable was always so long that it essentially was lying on the ground, so we'd just drive over. Along with everyone else. Pretty strange. We stopped in Playa Del Carmen, the biggest piece of civilization south of Cancun. We had lunch at a place that was this coffeehouse that made pretty crummy food and had worse service. 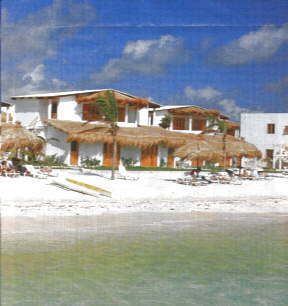 Our condo was in Akumal. Jim brought a Java book. I brought Spanish to study. Meryle brought a French deck of cards. The place that Meryle got for us was really great. It was the stereotypical beachfront condo. We had a kitchen, living room, two baths, and sliding glass doors that opened onto the beach. And there was a freshwater shower right in front. The beach was great for snorkeling. So great, in fact, that we went scuba diving just once. If you just put on your mask and fins, walk five feet into the water, and fall face first, you could just kick to anywhere you wanted. Well, ok, not like antarctica or something, but you know, I'm talking about like the limits of human endurance. Typically that's the only way to do it because the bottom was thick enough with rocks that it was hard to just walk out in your bare feet. And, the rocks are all coral. Coral is like solidified sponge material. Visualize jagged broken concrete, except make finer jaggs, and embed patterns in it that look like fossils. Not something you want to walk on. Or even grab on to while walking on something else. I remember once I was snorkeling and I swam back to shore, and I wanted to get as close as possible to the shore without having to walk. Well, I got closer and closer, but I kept on going. Finally I was in just enough water to keep me from scraping the bottom. Right in close to the shore, I must have looked like a little kid, a snorkel sticking up just a few feet from where the waves broke on the sand. There were all these little fish, toothpick size, all swimming around. They sortof blended in with the sand so I never noticed them before. If you went straight out and a bit to the left, you'd get to this big coral reef. The water it was in was typically three to six feet deep out there. The coral at its thickest went all the way from the sandy bottom to just below the surface. In a few places, coral stuck up out of the water, but just a few places. I swam to one of the places, but I couldn't go closer than five feet because of all of the coral. The fish were really fabulous. I took lots of photos (none of which appear here). I tried to go to the reef every day, but some days it rained and it was a bad idea. And every time I told myself I wouldn't spend much time there, but every time I ended up spending about an hour just swimming around in the reef looking at everything. I remember once I was sitting on the beach in front of the condo, and I thought I saw one of the rocks near shore move around. When I went over to check it out, it was a ray, swimming just a few feet off shore, about the size of a big dinner plate. 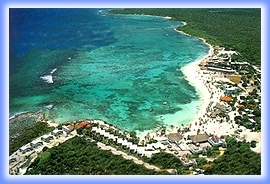 The original Akumal thing is a big hotel complex. We always drove on by. A road that goes north along the coast (lower left in the photo) gets to our hotel and several others, including houses that rent out whole. At the end there was this lagoon that Meryle remembered from previous trips, named Yal-Ku. Before it was all just rustic; you park the car and dive in. Now there was someone there telling people to get out by 3:30, and it was clear that they were going to start charging admission soon. There were several places to eat and drink. Most of them were clustered around the central area, but a few were scattered out our way. These were mostly open-air bars and restaurants, where you could stay till midnight and stagger home. Which we did on several occasions. The whole area is permanently humid. Fortunately it never got very hot while we were down there. Salt shakers were chronically clogged; the salt was like wet sand. The only salt shakers that worked were 50% salt and 50% rice. Tulum was this walled city on the coast, settled about a thousand years ago and abandoned soon after the Spanish conquest. 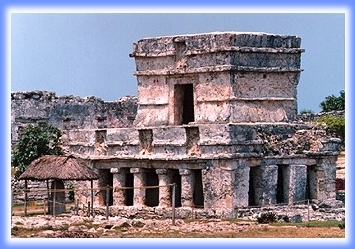 It is one of the few coastal ruins in the Yucatan. Jim and I went as Meryle had already been there. Yes, the beach does look that color, these are not color enhanced photos. Although not as spectactular as some of the other ruins in the area, it's right on the water, and while in the ruins you can walk down to the beach and go for a swim. This took me off guard as we didn't bring any of our swimming stuff. Tulum was a religious place of some sort. 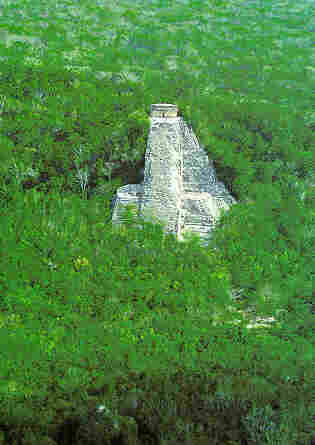 There's lots of priests burried there and more than a few buildings that are over cenotes. A lot of the buildings were roped off so we couldn't go inside. As we were walking through, there was a tourguide explaining what was going on. Unfortunately it was a group I didn't belong to, so I tried to just sortof look in some other direction, or else stand so that there was always someone else halfway in between. Like he was going to care. He said some interesting things, but when he moved on to the subject of Erich Von Dannekin and his theories on the Mayans and aliens from another planet, I decided to walk on. This is a side view; the cliff there has ruins on it that are partially obscured by the palm fronds. So that was good for an hour or two. Jim heard of this restaurant that friends had told him about. 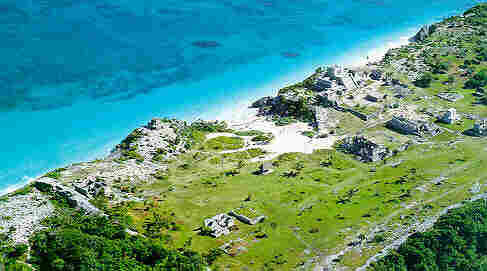 We went around looking for it, in "the villiage of tulum, it's different from the ruins". It was pretty confusing, because there were all these other communities springing up here and there to service the tourist industry. We ended up at the end of this road. Well, it wasn't the end, it looked like it went through, but there was a cable going across part of the width of the road, and there was rocks in the way of the rest and we figured we couldn't go through. Right then I saw a gringo down the road a bit. He didn't look like a tourist, he was on foot, so I figured he knew his way around. I said to him "Hey, you know if this road goes through to Tulum?" Then the guy goes "No, no, you americans are all the same. First you have to say 'Habla Inglese'. And don't say 'Habla English', it's Ingliese not English. Then you ask do you know if this road goes through to tulum." He helped us move the rocks out of the way. This was a bit strange for us but he kept on assuring us that this is mexico, there's no "authority" as we're used to in the states. He's lived here for twelve years. Just move the rocks out of the way and get in the car. He had this story about how he had to get this medicine and would we help him? I made a deal with him: he helps us find the restaurant, and we'll help him find his medicine. He struck me as the kind of person that could make a trip like this interesting. He spoke with a slight irish accent. His name was Dylan. So actually he sortof knew his way around, maybe. We found the restaurant, in a completely different location from where we originally were looking. It was like this little house set back from the highway. From the highway it looked like a driveway but as you drive down it you realize it's a city street, all the streets in this roadside community are dirt roads. The restaurant was like this house with a generous front porch with tables to sit at, and a really pretty garden out front. We all sat down and he was already chattering with the owners in his broken spanish, with a big, friendly style. I found that I could understand everything that Dylan said in spanish. This was mostly because he didn't know spanish much better than me. He'd sortof say things in English but substituting in Spanish words in place. And his vocabulary was about as big as mine so it all made sense, every word. He was really good at stumbling around in Spanish, and the people he met were good enough at understanding him. We must have met everyone in the family who ran the restaurant. Some knew more english than others; most didn't. They actually came from Italy so they knew italian. There was plenty of opportunity for word jumble but it all worked out. Apparently, Dylan had some chronic illness. He had just flown from Ireland, and one of his pieces of luggage was a small daypack that had his pills in it. On the plane or at the airport, he met some people and they gave him a ride to where he was staying, in Playa Del Carmen. Somehow he forgot that one piece of luggage on their truck, and he had to find it. He said he could die from it, like in 24 hours. For a guy who was this close to death, he seemed pretty relaxed, like, hey, no problem, let's have lunch and then we can go and get my life saving pills. Well, it turned out that the people who ran the restaurant knew the guy he got a ride from. They communicated in broken spanish/english how to get there. He was very grateful. So we all talked. He said he was a screenwriter and he worked with Robert Altman. Seemed incredible but he knew Altman's work very well, and seemed to know details in a way that went beyond what one would get out of People magazine. I can't remember everything we talked about but the guy was really wild. We finally left him off with the people who had his pills. The bacteria in Mexico is different from around here. And, there's more of it. Not really sure which is the biggest problem, but we were constantly aware of the risks and taking chances anyway. Fortunately none of us got sick. This one night Meryle and I wanted to go out partying, some place with dancing. To our horror, everything was dead. We had been noticing that there seemed to be a surplus of hotel space but it didn't strike us until that one night. We went all the way north to Playa Del Carmen. Got some cash. Dead. Like this one disco had one parked car in front of it. We finally ended up in Puerto Adventura, yet another tourist complex. It was dead, but some of the locals who worked in all the places were dancing in this one place. It was the ONLY place to dance we found all night! It was pretty creepy for us thirty-something gringos. Not only were we the oldest ones on the dance floor, but we were frequently the tallest. No kidding, Meryle (typical height for an american woman) was taller than all of the guys, who were of course mostly of Mayan origin. There's a precolumbian story of the leader of the Toltecs, who invaded the Yucatan a millenium ago. This leader, a man named Quetzalcoatl, was tall and fair-haired. The Tulum guide said that there was a theory that he was a Viking who somehow strayed into mezoamerica. Being much taller than anybody else, and having light skin and hair, he ended up becoming their leader, invading much of the surrounding landscape. He left behind a legend that he would once again come, from the east. The stage was set for an easy conquest by the spanish. More tourists showed up toward the weekend, filling up all available hotels. The contrast was amazing; one week before christmas everything went from 10% capacity to 99% capacity. Not unlike rush hour, except that this lasted longer. After the first few days, which had blazing sun, it actually rained a lot. There were several nights when the wind blew so hard I went around in the condo closing all the window louvers. I eventually started using a blanket on my bed. But we occupied ourselves. I learned more about Java internals. Jim was deep into his project. We all played Hearts, which I learned and, according to them, got decent at. So I was out on the beach in front of our house. I swear I could see enough to go snorkeling. I was afriad that something would go wrong, but, what the heck, you know the water's all shallow, what could go wrong. I started with just my mask but eventually I was out there snorkeling around. Of course it's not like during the day, everything's black and white and you just can't see any fine detail, but you could tell it was the same place, same coral, etc. What was really interesting was that every so often, there would be this little flash of light. I never figured out what it was. It was almost like a firefly-sized flashbulb went off. This is like once every ten seconds or so you'd see one. Different locations each time. It always seemed to come from a dark place, maybe in coral. Have no idea what it was. So we were supposed to fly back on Monday, we had a 1pm flight. So you show up two hours early (this IS mexico) and it takes one hour to drive from our condo in akumal, that's 10am. No problems. So we were sitting around on Sunday, the last day. It had been raining so we were waiting around for the sun to come out so we could go out and play. I was in my room reading the Java book. I heard people talking in the living room. I came out and Jim, who didn't know much spanish, was talking to this mexican guy who had come to the door, one of the people who ran the hotel.